Cool container garden ideas are excellent for your garden if you want to go over the edge. It’s nice to spice up your container garden by growing some beautiful colorful vegetables or even mixing up some vegetable varieties. These are one of the ideal ways to give the container vegetable garden some beautiful color. Here are some cool container garden ideas for you to experiment with…. It’s also a good idea to place your containers at the front of your house near the entrance. That can really catch a lot of eyes as it creates such a striking presence especially when it’s time to harvest your vegetables. You have the ability to pack all the vegetables you want into a small space by placing the baskets at varied levels. The best baskets are the ones that are about 14 to 16 inches in diameter. You can line them up with plastic liners. Apply a well-controlled released fertilizer to the potting soil and place soil polymer at the bottom of the basket. This is to reduce any water run-off at the root level. When choosing your plants, it’s best to go with the compact varieties. If you’re growing beans, you can grow them from the seeds, however you can mostly use seedlings. To keep the growth intact, rotate your baskets every 3 days. 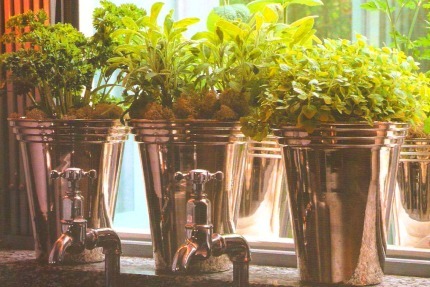 The best herbs for containers are parsley, sage and golden marjoram just to list a few. 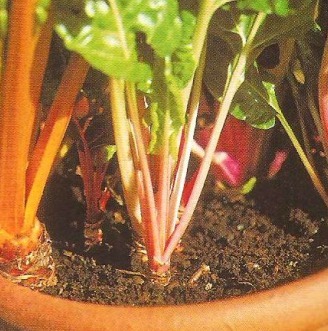 These do extremely well in pots near a sunny windowsill during the winter season. To add a little zip to your garden during winter, you can fill a similar container with some beautiful ever-greens and place them outdoors to create a soothing atmosphere. If you’re growing vegetables like lettuce for example, it’s not necessary to use deep containers. However, big containers tend to have a nice unusual presence. If you have a small garden you can position your containers to be the objects of attraction in your garden. 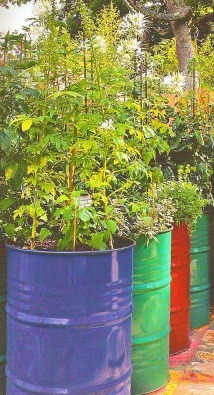 You can also use some painted oil drums to hold your edible and ornamental plants. Bush varieties of sprawling plants such as cucumbers and squash fit very well in big broad pots like a half barrel for example. Place it close to your house before you fill the pot. This is to make things easier for you so that you wouldn’t have to walk far when watering and harvesting your vegetable plants. Lemon cucumbers are good choices for containers and can be eaten straight off the bush due to their size. They produce small circular yellow fruits that are quite delicious. 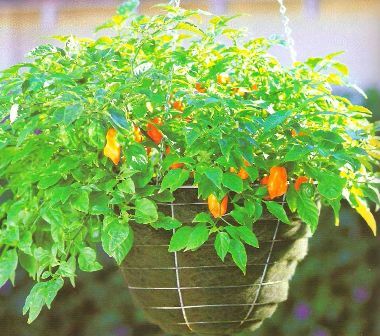 Sweet or bell peppers and chili peppers can grow very well in containers. To produce some good crops, choose a sheltered sunny spot. Be careful when growing hot chili peppers especially if you have children. It’s best to place the pots where they cannot be reached by your kids. 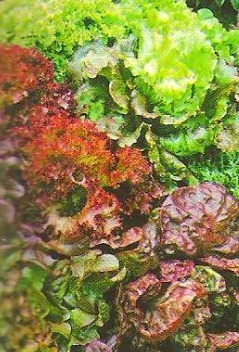 Lettuce and salad leaf crops do very well in containers. You can place the pot close to your house to make it very easy to harvest. Choose varieties that are colored or the ones with the beautifully shaped leaves. This is to give your crop great value as it will have a decorative appearance and a delicious taste. Try growing some single varieties or mix up the seeds from a few of the ones you like. If you want you can use the packets that contain the mixed variety leaves. Remember to always keep your pots partially shaded to prevent the soil from drying out. To make your patio pot exceptionally gorgeous, choose a colorful variety like the “Bright Lights” for example. To create a special color effect, you can grow the vegetable in a similar colored container or in a contrasting colored one. It’s nice to be creative and edgy by adding some great container garden ideas to your garden. These easy container garden ideas can make your garden look beautiful and outstanding so they’re definitely worth a try.